The LG G8 pushes features like Hand ID to unlock your phone and mid-air gestures to control things like volume. Neither worked well for us after extensive testing, but beyond these frustrating gimmicks, we did discover two likable tech firsts: a hole-less top speaker with innovative vibrating sound, and video portrait mode. None of these are reasons to overpay for this otherwise good but not great phone. There's a good, but not great phone underneath the LG G8 underneath my waving palm. It's another silly trick – this time a new way to unlock the smartphone – that distracts from LG's potential internal greatness. Its headline feature is the ability to read the blood in your palm's veins to unlock the phone, then trigger gestures to control music, take calls and wave off alarms, all without touching the screen. 'Hand ID' on the LG G8 is set up to be a futuristic way to authenticate and control your phone, but it hasn't worked like its Minority Report premise suggested and, even if it did work flawlessly, it doesn't make much sense. Update: We're still working on a final score for our LG G8 review, trying to determine the true price it'll sell at, and how the battery life and camera perform with a true week of testing. Stay tuned for the final verdict soon. This shouldn't divert your attention from other groundbreaking tech inside LG’s flagship Android phone for 2019, like video portrait mode and a vibrating Crystal Sound OLED for a hole-less display. This is where the real innovation is. LG G8 has no top speaker hole, and its vibrations provide a wider source of audio through the seamless screen. It’s a novel idea found in LG’s high-end OLED TVs, and tech that the nearly-bezel-less Samsung Galaxy S10 doesn’t have but could really use. LG is also first to video portrait mode, harnessing the Snapdragon 855 chipset. It takes what you love about portrait mode photos and applies the same background blurring effect, which makes for less distracting video. It's not perfect, and it's limited to the main rear camera, but it works (to an extent). There’s just one simple configuration of the LG G8: 128GB of internal storage with 6GB of RAM, expandable with a microSD card slot. That’s up from 64GB of storage in the LG G7, which is some relief. The 32-bit Hi-Fi Quad DAC also makes it a good value if you’re an audiophile. Ultimately, the LG G8 just doesn’t change the smartphone. It doesn’t fold, it doesn’t have a fancy punch-hole camera to extend the display from top to bottom, and it doesn’t have an in-screen fingerprint sensor. What it does have are new audio and video capturing tricks you should consider, and a 'Hand ID' feature you should ignore. And at its launch price, unless you get a deal through your carrier, this phone deserves to be ignored, too. The LG G8 price is all over the place, and that's part of the problem. It officially costs $819, according to LG, or $849, according to B&H Photo and Best Buy, in the US. It's much too expensive for a phone of this class. Surprise. It's already "on sale" for $699, and through a carrier contract, just $649. How do we even judge that against the competition? Who knows how long these "introductory promotions" will last. The LG G8 release date is April 12 in the US, and LG is planning to launch the less powerful LG G8s in the UK and Europe. Not stopping there, the LG V50 is also on the way – it's the LG V40 on 5G steroids, but doesn't have a release date and it's bound to be a lot pricier than its predecessor. The LG G8 has a 6.1-inch OLED display with a notch, matching the size and top cutout of the G7, but not the display type. Last year’s phone had an LCD screen touting something LG called "Super Bright mode." We found the LG G8 to get plenty bright in our tests, making the Super Bright LCD another one-off LG experiment you didn’t need in the end. No big surprise. The OLED upgrade is more noticeable than the downtick in lumens, offering deeper blacks and a higher contrast ratio. 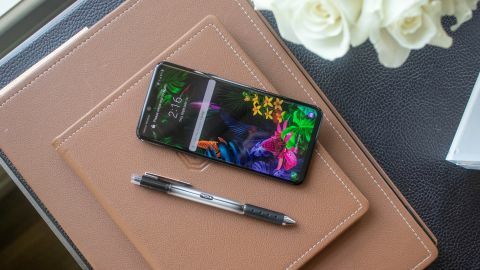 While its 6.1-inch display is a respectable size, its 83.6% screen-to-body ratio isn’t as impressive, especially since the Samsung Galaxy S10 clears 93.1% with the same-sized screen on a smaller, thinner phone. LG comes in three colors: Carmine Red, New Aurora Black, and New Platinum Gray. Each have a black front that does a good job at masking its ugly notch and thicker-than-average bezel surrounding the screen. LG doesn't make as big a deal of this as Samsung, but the 3.5mm headphone jack remains in 2019. The big issue with the LG G8's design: it doesn't have any standout features, or even ones that differentiate it from the pack. You’ve seen it all before: it has a rear dual-lens camera without a bump, a rear fingerprint sensor exactly where you’d expect, and metal frame sandwiched by strong Gorilla Glass 5 on front and Gorilla Glass 6 on back. In 2019, the design is unremarkable. What hopefully isn’t another one-off feature is LG’s Crystal Sound OLED technology. It eliminates the top speaker in favor of emitting sound through the same micro-vibrations found on LG’s high-end OLED TVs. Its vibrations weren’t big enough to feel distracting against our face, yet they reliably produced clear sound from a wider area. There’s a sweet spot at the top where you can hear a caller best, but we could still make out the conversation further down the screen. Crystal Sound OLED is more than just interesting tech – it offers a solution that could drive us to a 100% screen-to-body ratio one day, without relying on a poised-to-break pop-up selfie camera. We predict this idea will be used again by LG, and even copied by others. LG also claims this feature makes its phone more waterproof. We’ve tested supposedly waterproof phones, and water-logged speakers end up muffling any sound until they dry out. That shouldn’t be an issue with this hole-less vibrating speaker. The LG G8 pushes new unlocking and gesture controls with its Time of Flight Z-axis camera. We struggled to get the phone to unlock with 'Hand ID' consistently. And by consistently, we mean it worked every one in ten tries on average. Hand ID "works" by shining an invisible IR laser at your open palm in order to read the blood pattern in your veins. Neat so far, right? You hold your palm six to eight inches away from this special front camera and slowly move your hand backward. It's supposed to be an effective way to unlock the LG G8 when it’s sitting on a table and the fingerprint sensor on back is inaccessible. But it never worked for us consistently. Picking up our phone to get to the back sensor became easier. Inexplicably, Hand ID only allows users to register a single palm. So which hand is your favorite... or, since this is more work than it's worth, which is your least favorite? LG’s Hand ID and Samsung’s in-screen fingerprint sensor seem like technology ripped from the future. But, they also make us miss more reliable front-facing sensors from five years ago. Air Motion also uses your hand in conjunction with the G8’s Z-axis camera, this time to execute a variety of hovering gestures that don’t require touching the screen. We were able to turn the volume down in the music app, for example, by opening our palm to trigger Air Motion and making a ‘knob-turning’ motion in midair. It worked after a few attempts. Air Motion gestures worked a little better, but took multiple tries to get right. You can also receive or dismiss calls, swipe away alarms and timers, scrub through music and videos, and take a screenshot. When Air Motion worked, it felt fairly rewarding, and our non-techie TechRadar co-workers let out a mild "woah." But that was usually after a few minutes of trying to get it to function properly and being called "the world's [worst] Jedi."